MATCH REPORT Barça take Continental Cup with shootout win over Porto! 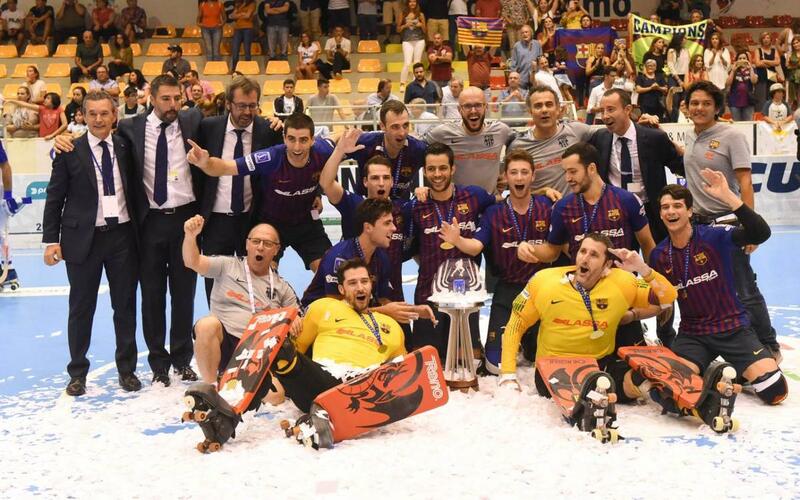 FC Barcelona Lassa won a dramatic penalty shootout in the final of the 2018 Continental Cup over Porto, making it the 120th all-time title for the Barça Roller Hockey section and 18th Continental Cup. Ignacio Alabart and Pablo Álvarez scored less than four minutes apart in the first half to stake the Catalans out to a 2-0 lead. But right away, Nalo Garcia pulled one back for Porto and, with play well into the second half, Rafa notched the equalizer at the start of one of the most frenetic minutes in recent memory. After Rafa’s goal, which tied the game at 2-2 in 44th minute, Barça’s Marc Gual struck back again only seconds later for a 3-2 lead. But that lead was just as short lived as the deficit that preceded it, as Porto’s Hélder Nunes knotted things right back up at 3-3. Three goals in a little over a minute had taken Barça’s 2-1 lead and made it all even heading into the final stretch. In overtime, goalkeeper Aitor Egurrola was spectacular for Barça, making two excellent stops late in the extra period, helping send the game to a penalty shootout. Joao and Sergi Panadero missed Barça’s first two attempts, but back-to-back goals from Alabart and Gual, along with Egurrola’s stellar goalkeeping, kept the blaugranes alive. Bargalló missed the fifth, but Gual scored again. And when Sergi Fernández missed for Porto, Barça's newest championship was in the books.